South Africa’s table grape markets in the Far East and South East Asia could be the beneficiaries of increased volumes of a new black seedless varieties introduced in the country. This is the view of veteran Hex River Valley grower, Leon Viljoen, who is a central figure with introducing new varieties from the International Fruit Genetics (IFG) breeding programme. IFG has been breeding new grape varieties in the US since 2001 under the leadership of Dr David Cain. IFG initially established contact with South African grower group, EXSA, of which Leon Viljoen is a shareholder. Since then, Viljoen has played a leading role in the evaluation of these cultivars in South Africa. 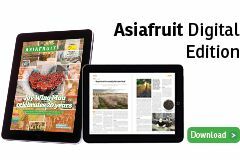 This week, with a number of vineyards laden with the new crop and harvesting due to start shortly, Viljoen showed Asiafruit the crop on two farms in the Hex Valley. “One of these varieties, Sweet Sapphire, is a unique seedless black table grape, with elongated berries. We believe it will play a huge role in our marketing activities in the Far East region,” said Viljoen. With black seedless varieties taking a back seat in the traditional markets of the UK and Europe in relationship to red and white seedless, it is clear that shipments to the Far East, where black seedless varieties are very popular, will be a major focus for South African growers and exporters. 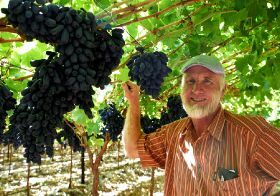 Some years ago, Asiafruit watched the packing of the first Sweet Celebration red seedless variety at Mr Viljoen’s farm Die Vlei in the Hex River Valley. Sweet celebration is another IFG variety now extensively being planted in South Africa as an early season variety. On the same day, the unique elongated black grape, now named Sweet Sapphire, was also presented to a private tasting of table grape experts. The same variety was named as a winner for young vineyards in the Hex River Table Grape Block Competition last year. This year another IFG variety, Sweet Globe – a white seedless – achieved the same honour in the Hex Valley. Elsewhere, at Viljoen’s farm at Trawal along the West Coast, Cotton Candy, Sweet Celebration and Sweet Sapphire have achieved similar honours. For many years, the South African table grape business has been “stuck in Europe” as one expert put it. During these times, although there had been some growth in Asia, around 80 per cent of the South African crop had been shipped to Europe. In all fairness, exchange rates and maximising returns back on the farm also played a role with South African exporters, who have made more money in non-US Dollar markets. The performance of Sweet Sapphire will therefore be watched with great interest in the years ahead, as will be the ability of red seedless varieties such as Sweet Celebration.